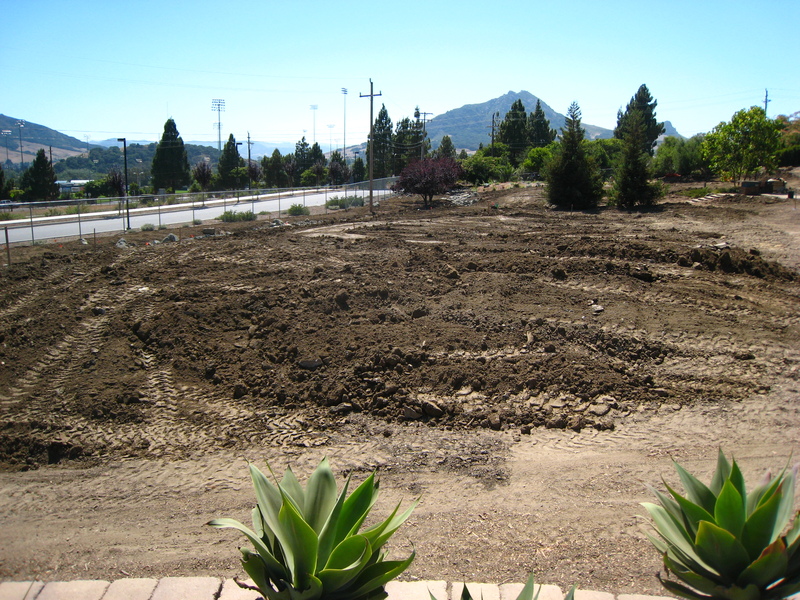 For me, the weeks between the swale’s completion and the end of summer are a huge blur of dirt. Dirt, dirt, and more dirt. 4,000 yards to be semi-precise. A major portion of this project involves raising the soil level about one foot, which I’ve roughly found to translate into dump truck piles of dirt every 6 feet. All dirt (or soil if you prefer) brought in was first deposited in our soil stockpile to the left of the Disease and Pest building before being picked up and re-dumped on site. 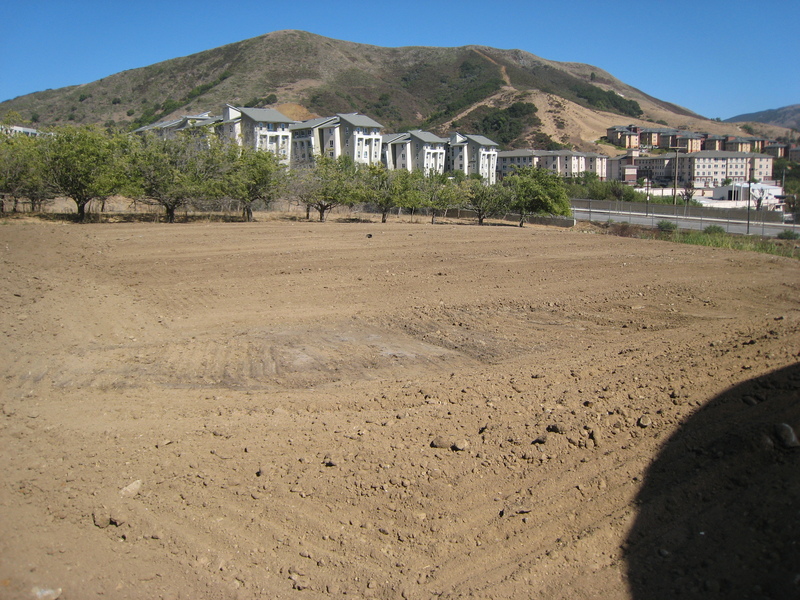 Our soil repository as it grows with every new load of soil. 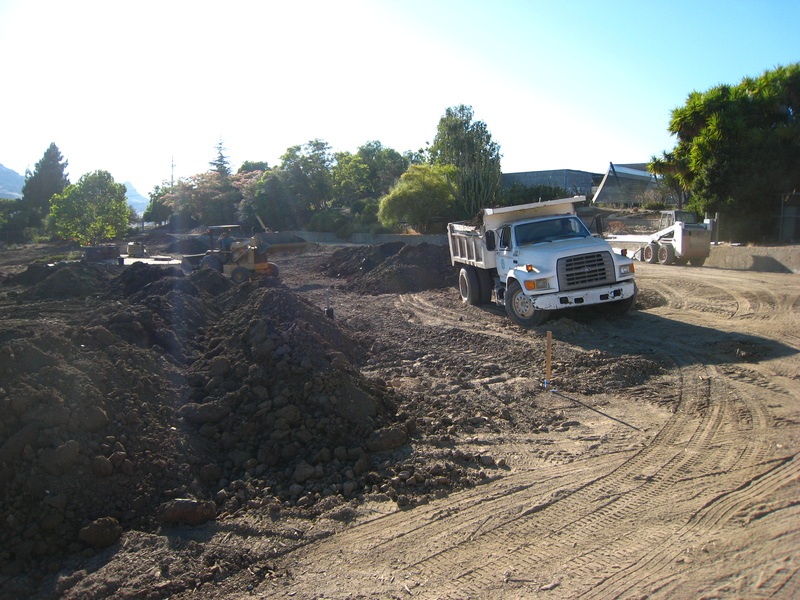 Our dump truck bringing soil from the stockpile to the site. This process of back and forth dumping continued for days. 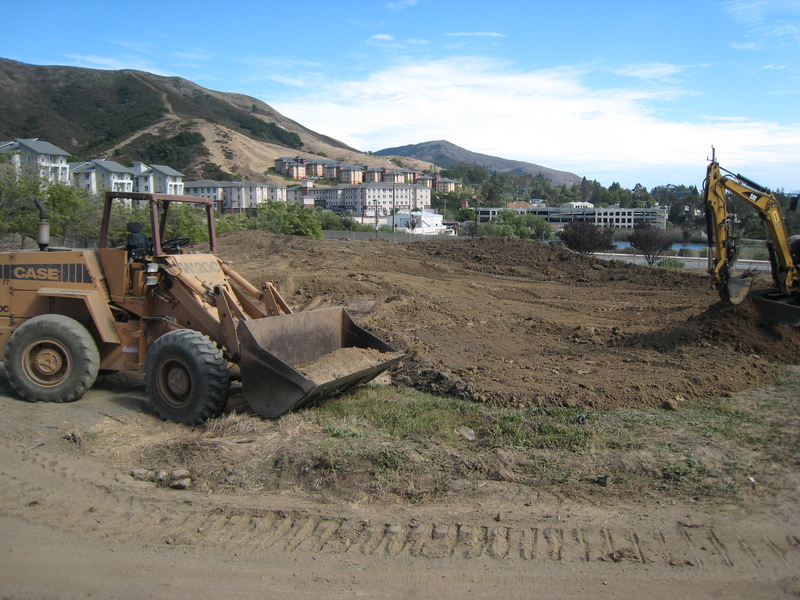 Using the skip loader, we could loosely move around the piles enough to continue dumping and raising the grade. An approximate representation of where the pathways and the teardrop stage--in center--is to be. As great as the skip loader is, the volume of soil still needing to be moved and shaped was going to be too much for it to handle. Enter bulldozer. 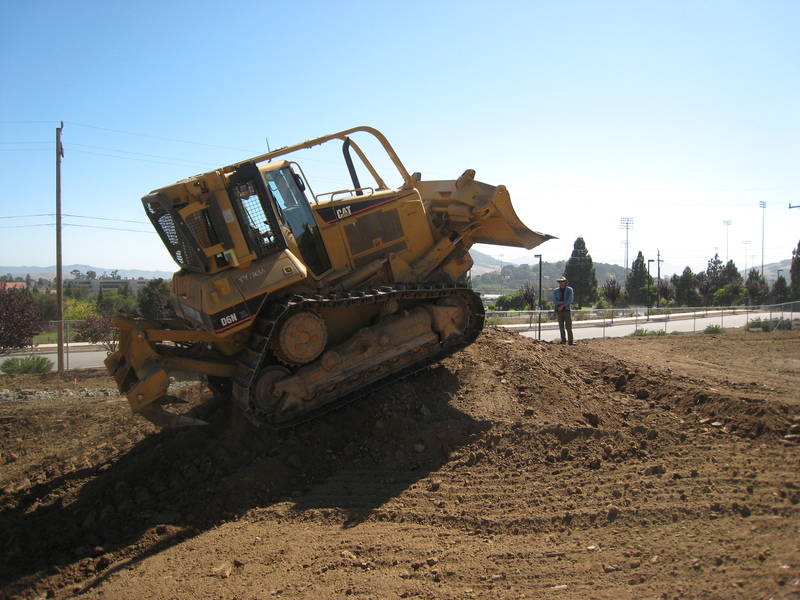 Renting both a huge Cat dozer and an experienced operator, both the soil repository and the site grading seemed to clean themselves up in the blink of an eye. This monster of a machine effortlessly pushed mountains of dirt around as if nothing was there. Needless to say, I wasn’t allowed near it. 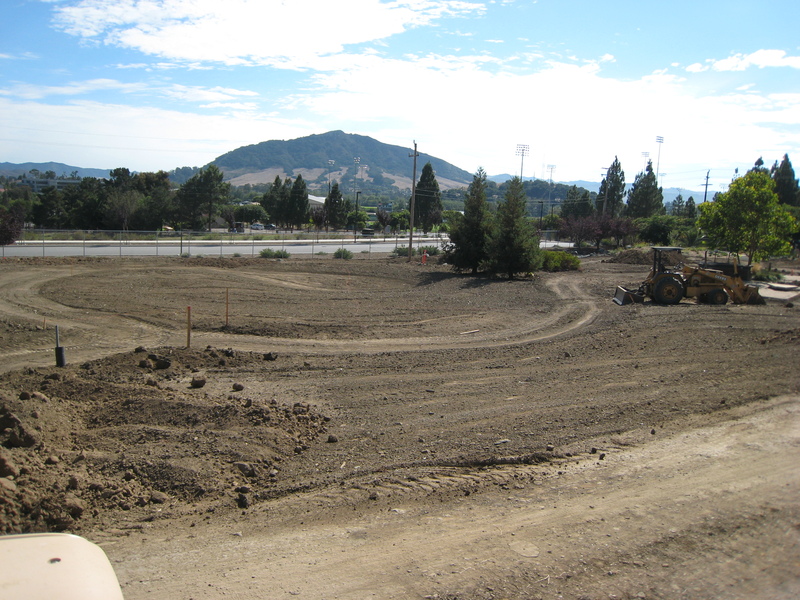 The once haphazard stockyard of dirt, now flattened by the dozer. 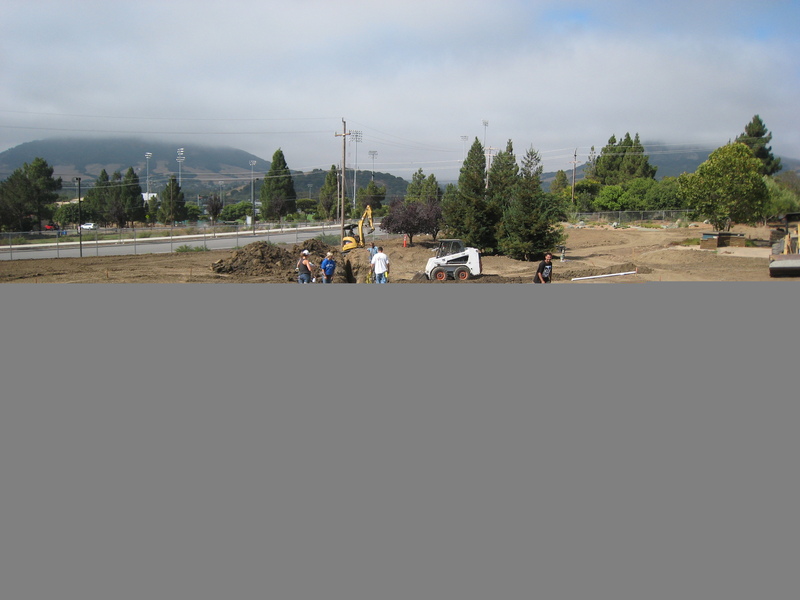 Now that the site had been expertly graded with all the soil in place, it was time again to tear it all up and drop a main line in. Once this project began, I don’t remember a time where my hands were any color other than blue or purple. 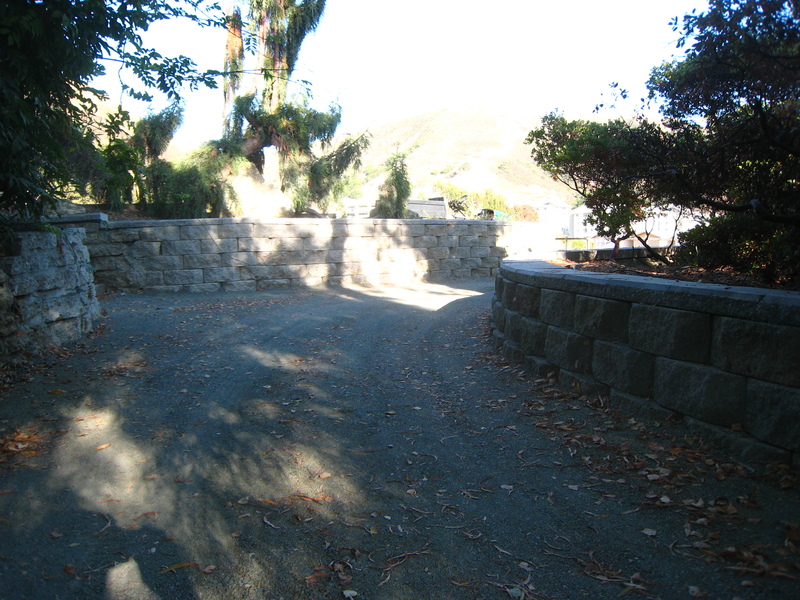 The main line cutting right through the middle of the site. This was also the beginning of my life, chest-deep in a trench. Devon, Brittany, and Sara working on gluing the main line. 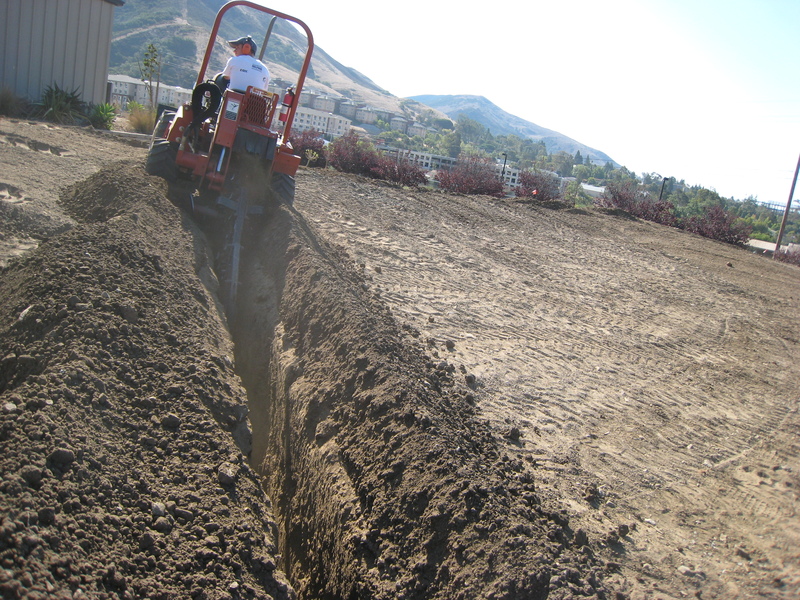 The lines after being filled and thoroughly whacked with the whacker to reduce future settling. My second favorite machine. Think of this as a jackhammer with a flat bottom. It “hops” around while compacting the soil to avoid settling later. Awesome. 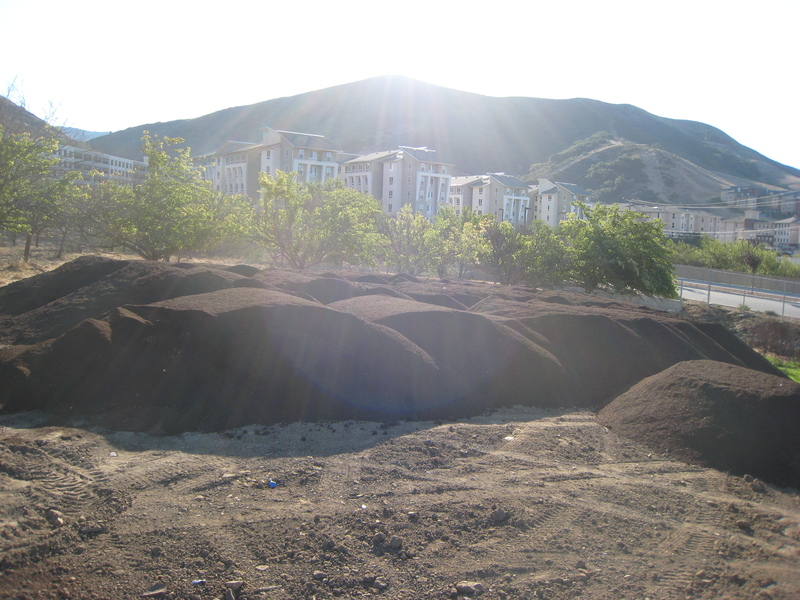 Lots and lots of compost ready to be tilled into our soil. Loving it. 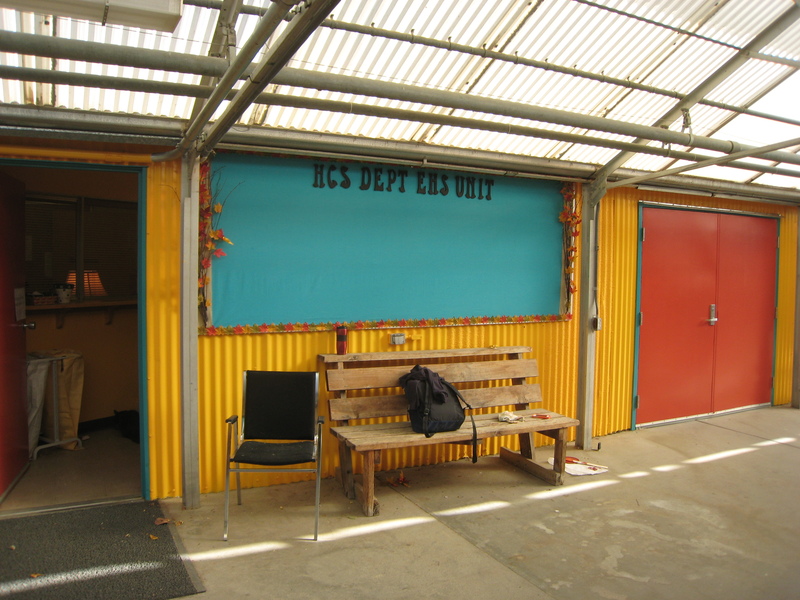 Meanwhile… the greenhouse breezeway got a bit of a makeover. Yellow and red with a turquoise trim? Looking good breezeway, looking good. 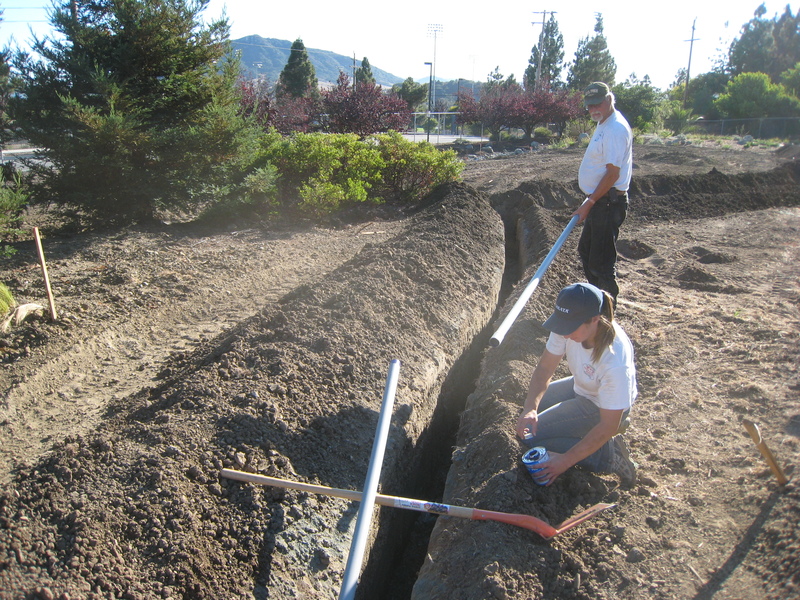 Our main line trench needed to fall deeper than our on-site equipment could deliver. Enter Ditch Witch. Dr. Lewis introduced me to this majestic machine on one of the hottest days we had all summer and I think its A/C was broken. 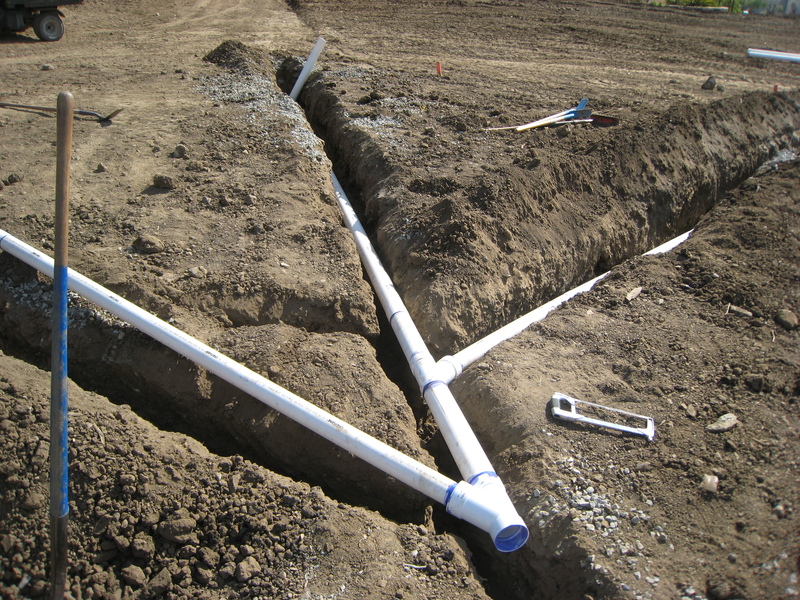 We utilized a system of pipe gluing using shovels to hold up sections of main line before dropping section in the trench. One of my favorites. 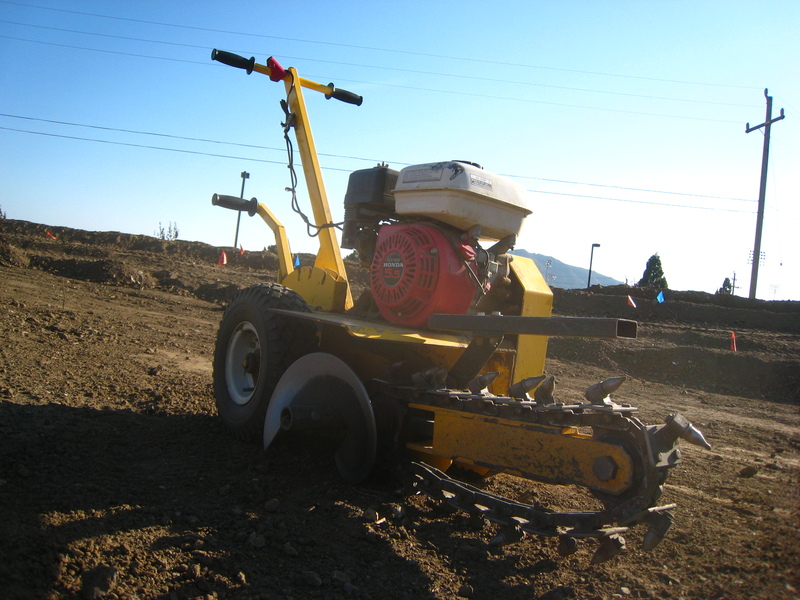 The Ground Hog is a delightfully elegant trenching machine- perfect for digging our lateral lines --and there are a lot of them. 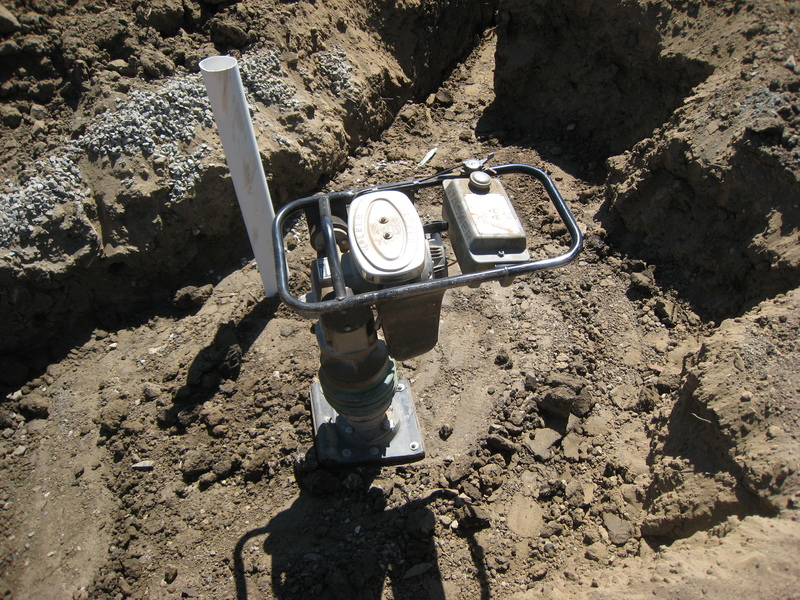 After our main line was all pretty and glued, we blew it out, pressurized, and checked for leaks. 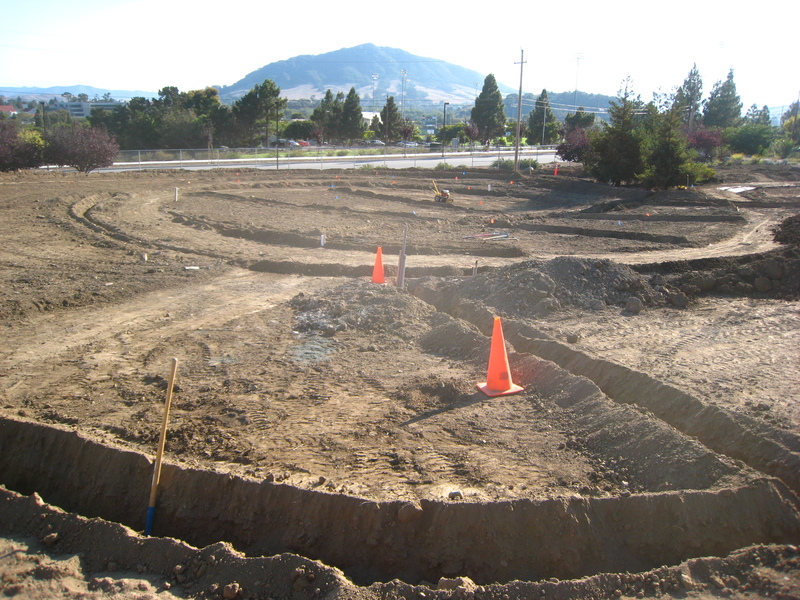 Luckily we did a fantastic job and there were no repairs to be made, which allowed us to immediately start digging trenches for our lateral lines. 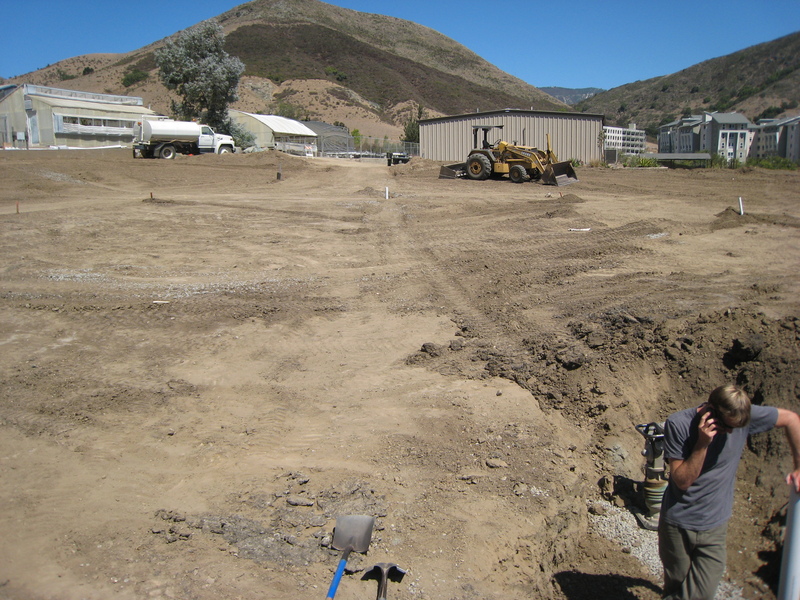 The mosaic of trenches in this picture will be filled with our 1’’ pipe and Hunter heads. 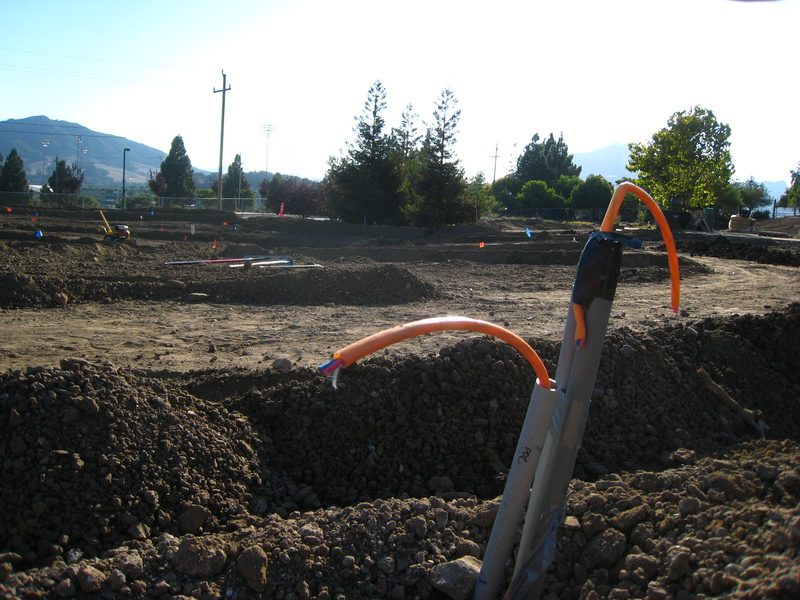 Our irrigation will be utilizing the latest and the greatest from Hunter Industries. Our controller will be none other than Hunter’s new ACC two-wire decoder- very exciting. 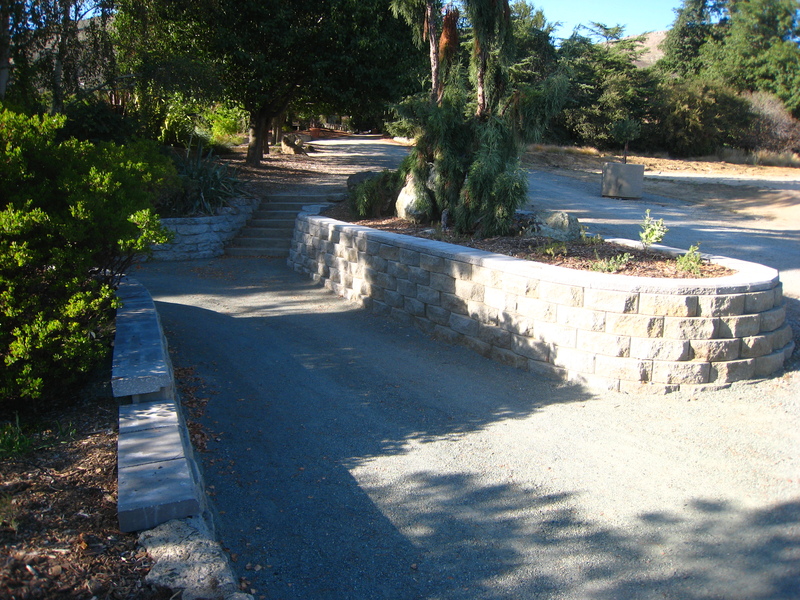 On a side note… our beautiful new path to the green waste bins is finished! It looks just as good as it functions. No more will we be forced to take the scenic route up through the arboretum to toss a load full of trimmings. Good for us and good for Wassenberg. As hot, physically demanding, and stressful as this summer was, I had a blast. There was nary a day I went home without feeling filthy and exhausted, just how I like it. 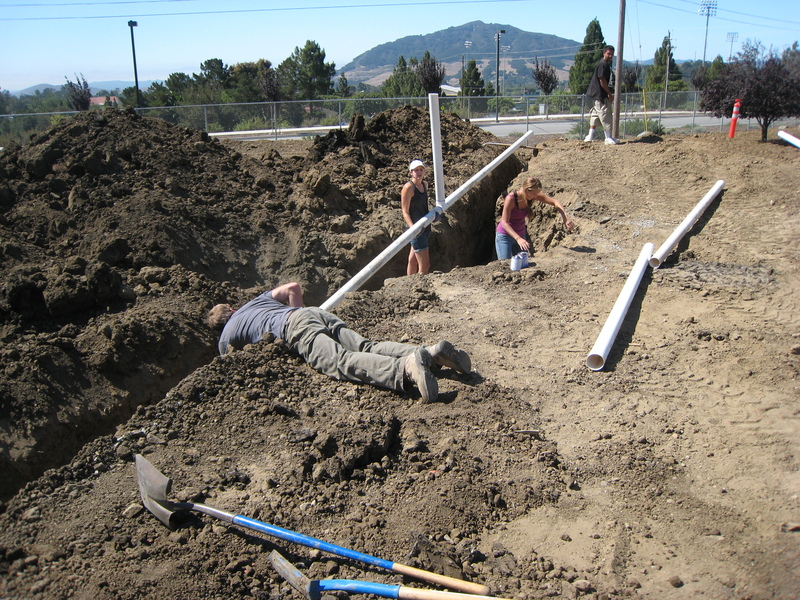 It was the classic hands-on experience that could only be found at Cal Poly.